Select an option Silver/15" (short) Silver/16" Silver/18" Silver/20" Silver/22" gold/15 (short) gold/16" gold/18" gold/20" gold/22"
A dainty Mothers Necklace to represent mom and kids. A thoughtful and sweet baby shower gift for the new mom-to-be. 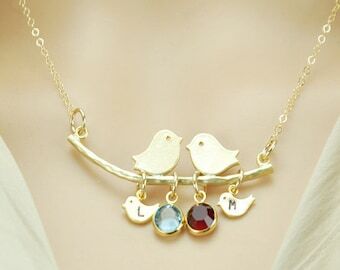 Bird jewelry can be customized with kids initials. 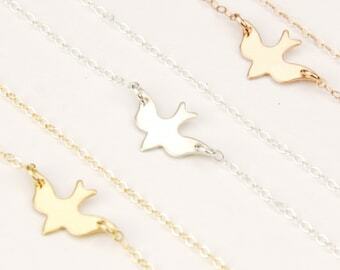 --Bird on the Branch: Matt silver or matt gold plated over brass: Size: 1-7/8" x 7/16" (48 mm x 11 mm). --Dainty sterling silver chain and clasp with findings. BABY BIRD CHARMS: Matt Rhodium or matt gold plated plated measuring 5/16" x 1/8" (8.5 mm x 6.5 mm). SWAROVSKI BIRTHSTONES: Choose the birthstone colors from the chart in the photo, 1/4" (6 mm) in size. 1. Your choice of initials starting from left to right. Ex: A, C, G, S.
2. If you choose birthstones, your choice of birthstones from the birthstone chart photo provided above. Example: May - Emerald. 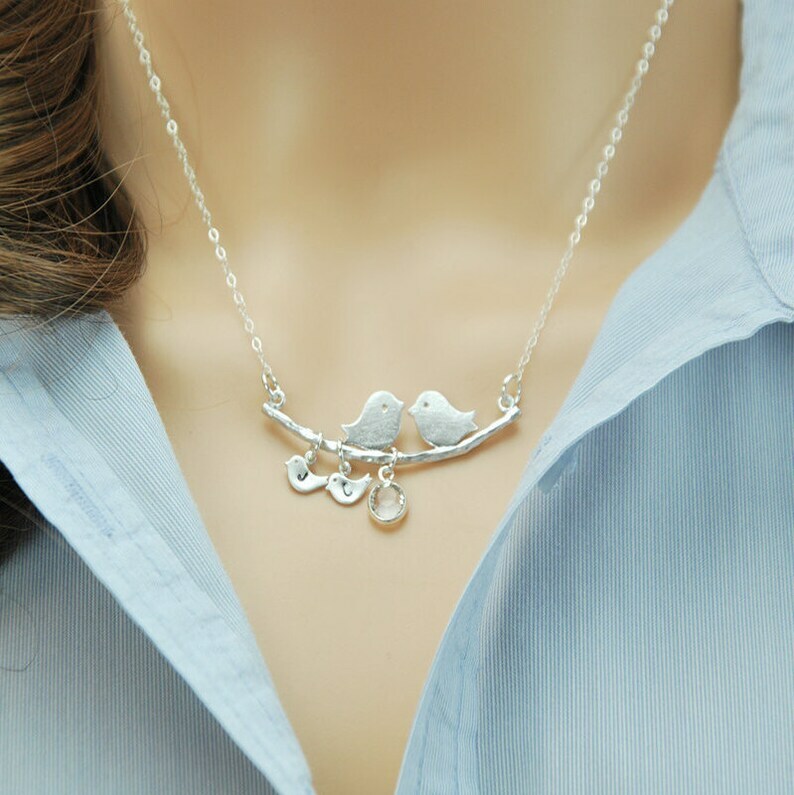 DROP DOWN MENU AT CHECKOUT: Please specify the length of chain as well as the number of bird charms, leaf charms, birthstones you desire. All items are made to order. Our production time is approx. 3 to 5 business days. Shipping times do NOT include production times. Shipping times can take approximately 4 to 6 business days, longer during holidays. International shipping can take from 2 to 4 weeks and longer during holidays. Customs can hold your package from 5 days to 3 weeks. Excellent customer service by Karen! Karen was very responsive throughout the process and answered all my questions right away. I will definitely get more custom things from this shop in the future. I love it so much!!! This is exactly what I was hoping for and it’s beautiful! !